Poor interview technique cost one technology company a lot of bad press recently when the CEO was accused of bullying a candidate. Beyond what appeared in the public domain, we are not privy to what actually happened. But sadly we do get to hear first-hand some pretty cringe worthy stories about employer’s interview technique and recruitment processes. How you interview and how you handle your recruitment process matters. Get it right and even the individuals who didn’t get the job will be your company ambassadors, get it wrong and you potentially affect your reputation as an employer and will find it more difficult to attract the right candidates. You might not make the newspapers but social media and word of mouth are both very powerful. Go beyond the job spec (but do write one) and identify what the critical business need is. Identify the qualities you are seeking and how they match with your culture – then tailor everything in your recruitment process to finding the right person to solve your critical business need. If you decide you need an outstanding admin manager, define what you mean by ‘outstanding’ and how you will identify if a candidate is outstanding. Does it mean some specific experience, qualification or performance at the interview? At a time of high employment, be prepared to be flexible and consider transferable skills and the potential for training. Explain the recruitment process to every candidate. Candidates selected for interview should know exactly what to expect; when they will be interviewed, where they will be interviewed and who will be involved in the interview. Make sure there are no surprises, no bad practices, no uncertainties and no confusion. If you don’t portray your organisation as a great employer from the very start, the best candidate may decide your company is not the right fit for them. Too many managers glance at a CV a couple of minutes prior to the interview. Leaving to the last minute means being unlikely to be able to ask insightful and intelligent questions or hold a meaningful two-way conversation. Use the candidate’s CV to prepare probing questions about accomplishments, work ethic and attitudes. Do a quick LinkedIn and social media check to explore outside interests and who they network with. Have a conversation, don’t interrogate. You can’t have a conversation unless you do some preparation. You simply won’t know enough to do anything other than ask questions. When an interview is conversational (and you listen effectively) candidates relax, speak more freely and provide more detail. Have a grown-up, respectful conversation and don’t use tricks or techniques to put the candidate under pressure. The most revealing answers usually come from follow-up questions. Listen to the initial answer, then probe the candidate’s answers with the interviewers tried and trusted friends, who, what, where, when, why, how and tell me more! The best candidates are assessing you, your company, and whether they really want to work for you. If they are interested they will ask questions. Be open and honest with your answers but resist the temptation to oversell. At the end of the interview always describe the rest of the recruitment process. Explain what you will do and when you plan to do it. Don’t force the candidate to ask. Tell them and if there are any changes following the interview communicate with them. Follow up – with everyone. It’s a fundamental business courtesy that says lots about you as an employer. Failing to follow up is incredibly rude, will be remembered and broadcast widely by those who invested time in your recruitment process but received little courtesy in return. Be decisive and make an enthusiastic offer. Good candidates are in high demand. Don’t introduce delaying tactics or anything that will reduce the enthusiasm the candidates has to join your organisation. Be decisive and don’t be reluctant to show that your excitement at having found the best candidate. You and the candidate should be pleased to have found each other – there is no upper hand in the business of finding the best talent. 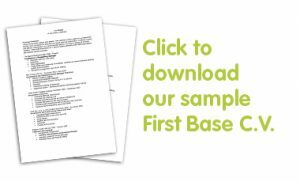 Employers and candidates tell us that First Base is their first choice for help with their recruitment requirements and their personal career progression. If you would like to know more about how the First Base team could help you, contact us on 01453 755330.